My Mom asked me to make a birthday card for one of her friends this month. This woman loves flowers and February's flower is an Iris. I have an entire collection of birth-month flower stamps from Sweet n Sassy Stamps. I found this lovely new collection from K & Co. by Tim Coffey called Cottage Garden. Love, love, K & Co.! They haven't produced a collection yet, that I'm not absolutely in love with. The patterned paper, die-cut accents, and border strips were a perfect match to the Iris image stamp! I used Perfect Plum Stampin' Up! cardstock as my card base and Always Artichoke Stampin' Up! cardstock to mount my oval layers on. Image and sentiment were stamped in Black Palette Ink. Crushed Olive Distress Ink by Tim Holtz was used to stipple the Very Vanilla Stampin' Up! cardstock. What a pretty card Jennipher! I LOVE that color of the DSP & that's a beautiful image!!! Your coloring is truly awesome and the popped up dragon fly is the perfect finishing touch! TFS!!!!! Yeah, K&Co is bad for my paper addiction! She is going to LOVE this!! Amazing card! Very pretty! I really like that paper. Orchids are so lovely, aren't they? Hi Jennipher, what a beautiful card! Makes me think about summer and how excited I am to plant some pretties in the front of the house. 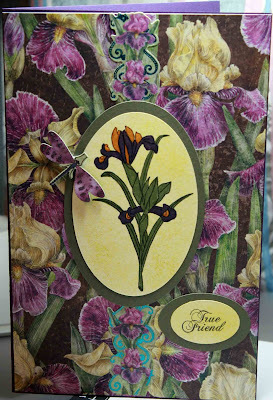 Very pretty card, I love Irises! And I have quite a collection of K& Co, they certainly produce wonderful papers.